Pune is a beautiful city in Maharashtra that has turned into a hub of youngsters due to the many colleges and other educational institutions that have started to crowd the city. Due to the this, Pune has a nickname of Oxford of the East. Historically, it is rich with the heritage of the Marathas. A great thing about living in Pune is the array of things to do on weekends. The city is surrounded by one too many getaways, especially exciting for those who love adventure. So for all the adventure enthusiasts living in Pune, here are the top 8 forts that you can plan for an expedition to. The best time to go on these treks is during winter or monsoon seasons. However, trekking during monsoon can be dangerous, but the view towards the end will be worth it. This historical fort of Maharashtra is one of the most sought-after trekking destinations that is located 170 km from Pune. The fort is made of two fortresses namely Manaranjan and Shrivardhan and was built in a strategic location that controlled Borghat pass. Two routes can be followed to reach the fort - one from Lonavala while the other can be taken from Karjat. Night treks are also made to Rajmachi Fort because it is a great place to spot beautiful fireflies. Kalsubai is the most popular trekking destination since it is the highest peak in Maharashtra, which is why it is often referred to as the Everest of Maharashtra as well. It is perched at a glorious height of 5400 ft and is located about 180 km from Pune. Although many well-defined routes are available to reach the summit, the most used one starts from the village called Bari and goes through a Hanuman temple; the route might have some rocky outcrops. Perched at a height of 4,603 ft, the Torna Fort is a historically significant structure since it was the first place that was captured by Shivaji Maharaj. He did so at a young age of 16 back in 1643. It is located just 68 km from Pune, which is a 2-hour drive away. Velhe is the base camp of the Torna trek from where you will find a man-made waterfall, cascades of water, uphill track and it takes about 4-5 hours to complete the trek comfortably. The significance of Shivneri Fort lies in the fact that it was the birthplace of Shivaji Maharaj. It is a relatively easy trek and is an ideal one-day trip from Pune. In order to reach the top, one needs to pass through the 7 doors of the fort. Shivneri Fort is located 95 km from Pune and it takes about 3 hours to reach the place. Visit Badami Talav, Shivai Temple and more, which are all a part of the fort. 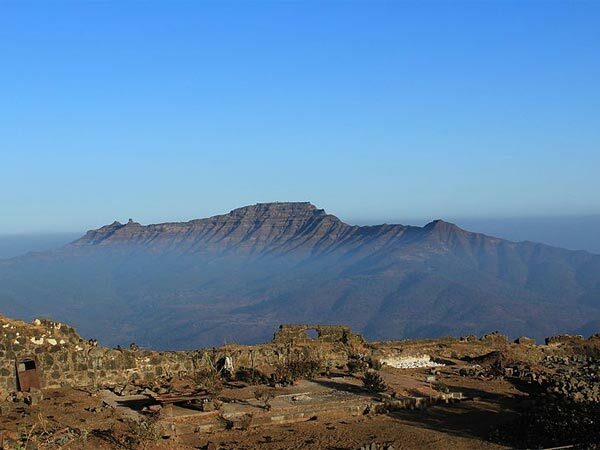 Also known as Vichitragad Fort, the Rohida Fort is now a beautiful trekking spot that was built by the Yadavas. Later during the 17th century, the fort was captured by Shivaji Maharaj. The fort has three gates and a beautiful rock-cut water cistern. The base village for this trek starts from Bajarwadi village. Rohida Fort is located 62 km from Pune. This 2000-year-old fort overlooks the beautiful village of Bhandardara and is located 183 km from Pune. Trek to the spot during November to see the best of flowering plants covering the route. A cave near the fort is one of the attractions of the place. It is an easy, one-day trek. Do some sightseeing in the hill station of Igatpuri, which is located nearby. Located just 30 km from Pune, Sinhagad Fort is the quickest escape for your weekend. The fortress includes caves and Kaundinyeshwar Temple. Sinhagad literally means Lion's Fort and was built in order to provide a strategic protection. The difficulty of the trek is easy and perfect for beginners, where the route takes you through shrubs, rocks and meadows. Harishchandragad is a hill fort is located at a distance of 172 km from Pune and is home to several interesting spots that you can visit, such as the Kedareshwar Cave, Saptatirta Pushkarni and several other caves as well. Kokan Kada is a cliff that offers the most stunning panoramic view of the entire valley. This is comparatively a harder trek that begins with an easy trail but goes on to have rocky and tough terrain. The base camp of this trek is located at the Belpada village.